On the Impossibility of Casting Away the One Ring. So Why Even Try? The point has come in which a decision has to be made concerning the Ring. The time of hiding and waiting (not that Frodo had known that he was doing either of these things) has come to an end. Sauron knows that the Ring is in the Shire and that it is possessed by a hobbit called Baggins. Frodo will take the Ring to Mordor but at the last he will fail to cast it into the fires in which it was made in Mount Doom. Only an inbreaking of the most extraordinary grace will finally destroy it. And yet, surely, we already have evidence enough here, in the peace of Bag End in the spring time, to know that the task is far beyond Frodo’s capacity to achieve it. When Gandalf encourages Frodo to try to “do away” with the Ring he fails miserably. And so right at the very beginning of the story Frodo fails even to cast the Ring into the small fire burning in the grate at Bag End, a fire as we have already seen would have no effect upon it at all so what chance is there that he might cast it into the Fire of Orodruin? Gandalf makes it clear that Frodo has little talent for the task, anyway, that he lacks the necessary power or wisdom so why not give the Ring to one who possesses both power and wisdom too? 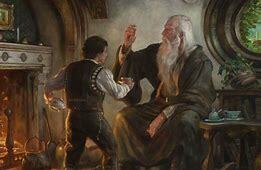 Frodo offers Gandalf the Ring. And with that reply Gandalf makes it clear that it is not just Frodo’s wisdom and power that are insufficient to deal with the Ring but his own too. If Frodo has too little of either then Gandalf has too much. This quest, the search for the Cracks of Doom and the destruction of the Ring, will not be achieved either by strength or even by wisdom. Then how is the Ring to be destroyed? Surely the clue lies in Gandalf’s words to Frodo. “You may be sure that it was not for any merit that others do not possess: not for power and wisdom, at any rate. But you have been chosen, and you must therefore use such strength and heart and wits as you have.” It is in the words, “but you have been chosen” that we learn how the Ring is to be destroyed. 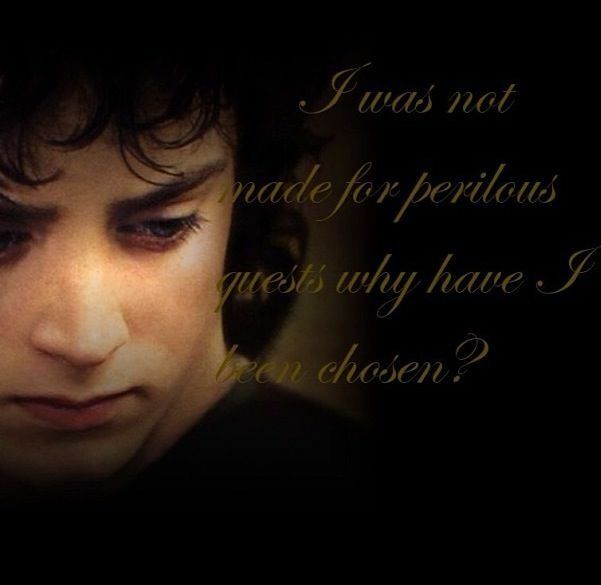 Frodo will have to leap into faith and to travel, step by step, to the Cracks of Doom and there he will have to do what he can. At no time will there ever be some kind of blueprint for him to follow. No one will ever say something like, “When you get to Mount Doom this is what you have to do”. And that is because no one, not even Gandalf himself, knows what to do apart from the need to cast the Ring into the Fire and we have already seen that Frodo does not possess the capacity to do that and neither, as far as we can see here, does Gandalf. The Ring is too powerful for either of them. Some other power, the power that has done the choosing, will have to intervene. One might wish that this power would give a little more guidance, either to Frodo or to Gandalf, but all that is given is the choosing. And that is enough.